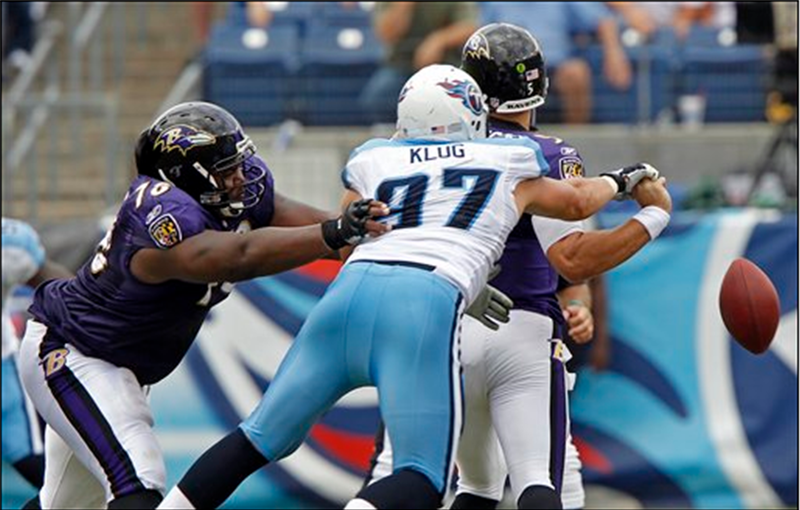 Baltimore Ravens quarterback Joe Flacco loses the ball as he is hit by Tennessee Titans defensive tackle Karl Klug (97) in the second quarter of an NFL football game Sunday, Sept. 18, 2011, in Nashville, Tenn. At left is Ravens tackle Jah Reid. Defensively, 2011 Draft Class Off To A Fast Start. I love to say I told you so, the Titans did a really good job of drafting defensive players in last April's draft. In today's links, you probably saw the list from Pro Football Focus about the early race for Rookie of the Year and how this year was really strong for rookie defensive linemen. 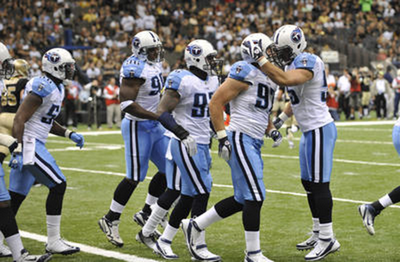 Well, the Titans had two players on the defensive line and one more at linebacker. Let's start with Karl Klug. I was a huge fan of this pick as soon as it was made. The fifth round for a guy who had improved that much in three years and a boatload of desire to get even better? Sign me up, this guy went from nobody to stud in no time at all. I was expecting him to get time at defensive end, but he seems to be just fine and is holding his own at tackle. Klug spends most of his time in the enemy backfield crushing and/or hurrying the quarterback. In limited time, he's got three pressures, three hits, and a sack. In limited time. Just keep doing what you're doing Karl, you'll crack the starting rotation in no time. Next up, Jurrell Casey. We were promised nasty explosiveness. Check. We were promised disruption in the backfield. Also check. He's ready, he was born ready. It's funny 'cause he's already got eight times as many tackles as Jerry Hughes. Things aren't looking good for Sen'Derrick Marks. I feel bad for the guy, but the best players gotta play and before long, Casey and Klug are gonna be the best players. Finally, my pick for DROY in the preseason, Akeem Ayers. Although I'm at least a tad bit disappointed at how he's played so far, Ayers has already been noted as a top rookie twice by PFF, so expect for him to at least be in the conversation. Week one was an early coming out party as Ayers made some nice plays in the run game, but after that he seemed to drop off a little bit. At times he just seems to disappear out there. That's what I was kind of afraid of when he came in here, he's not the most physical linebacker and when he's forced to take on blockers head on, he struggles at times. However, he's playing really well against the run when given the opportunity, the pass rush will hopefully follow suit. In terms of upside, I've still got Ayers at number one for the defensive players in this draft. He just has so many unique skills that make him perfect to be the next do-it-all linebacker. I have visions of Ayers blossoming into our own version of Baltimore's Terrell Suggs. It's a stretch, as Suggs was praised as an undersized, but dominant pass rusher coming out of school and Ayers as a coverage-first outside linebacker, but Suggs has changed his game by excelling in run support and becoming a crucial part of his team's defensive scheme. TULSA, Okla. -- Two days after winning one of the college football season's early marquee games, Bob Stoops was rewarded Monday with a new contract extension that could keep him as the coach of top-ranked Oklahoma through 2018 and pay him $34.5 million over the next seven years. Oklahoma's board of regents voted to give Stoops a $75,000 bump in his annual salary and a handful of bonuses that will reward him for staying in Norman each June -- after the coaching carousel has usually run its course. "I don't think I need to add anything to the proof that he gave to the national viewing audience that there's no better football coach in the country than he is," university president David Boren said before recommending approval of Stoops' new contract. The deal calls for Stoops' paydays to grow over the years, topping out at $5.15 million in salary and bonuses over the final three years. He was already one of the highest-paid coaches in the country, making $30 million over the course of a previous seven-year deal approved in 2009. The extension made no changes to his salary for this year, when he is set to make $4.875 million, including an $800,000 bonus he received on Jan. 1. "In my opinion, he does not have a peer in college coaching either in terms of his strategic abilities as a coach, but also in terms of his example as a role model," Boren told The Associated Press. "The quality of the players on our team as people is just extraordinary. They are caring people, they set very high standards for themselves, they are very modest and generous to others and that doesn't happen unless you have a coach who sets a very powerful example for them." 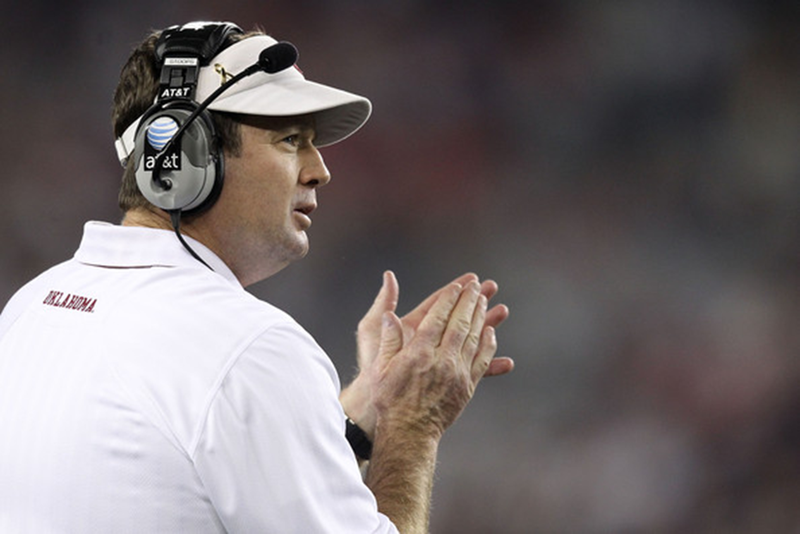 Stoops' Sooners won 23-13 at fifth-ranked Florida State on Saturday night, moving his record 100 games over .500 at 131-31. Regents also gave athletic director Joe Castiglione a three-year contract extension through June 2017, including an annual raise of $165,000 and an annual bonus of $110,000 each Oct. 1 starting in 2013. His total salary this year will be $915,000 without bonuses. "We have excellent leadership in Joe Castiglione. He has brought to the university I think across the board the strongest group of coaches that we've ever had," Boren told the AP. "I feel really blessed," he added. "I just would put our total athletics program up against any in the United States, and I don't think anybody exceeds our standards." 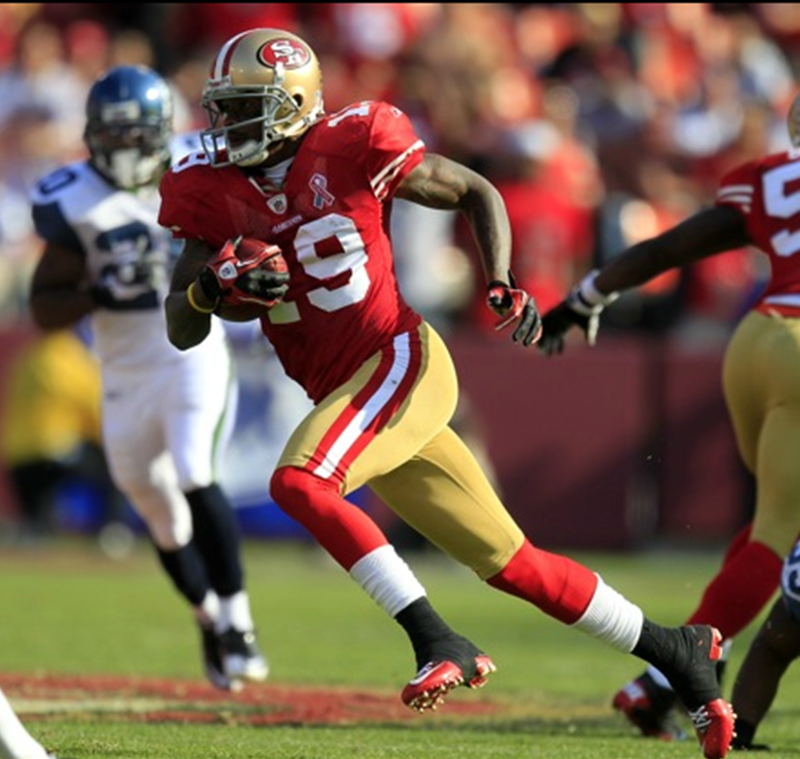 Ted Ginn, WR/KR/PR, San Francisco. Hard to be a more valuable special-teamer than Ginn was in the 49ers' season-opening win over Seattle. When the Seahawks got to within 19-17, Ginn returned a kickoff 102 yards, and later a punt 55 yards, both for touchdowns, to make the difference in a 33-17 win. How thrilling and wow-inducing were Ted Ginn Jr.'s two kick-return touchdowns Sunday afternoon? Brad Pitt now wants to play him in a movie. The 49ers would likely have won their season opener without Ginn on the roster. 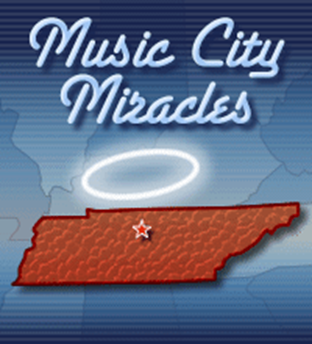 But they would not have created as much excitement -- or as many video highlights, or as much hope, or as much downright amazement at the way Ginn scored touchdowns on two kick returns in the final four minutes of the game. "I would do anything for that speed," said one of the amazed, 49ers wide receiver Joshua Morgan. I know, I know. On a strict mathematical basis, Ginn's scores weren't the difference in the game. The 49ers beat the Seahawks by 16 points, 33-17. Therefore, when Ginn returned a kickoff 102 yards and a punt 55 yards across the goal line on his take-your-breath-away plays barely a minute apart ... well, those two touchdowns were not technically mandatory. But they were totally necessary. The 49ers desperately needed to convince their followers and themselves that this season holds actual promise rather than more false belief. They needed much more than just a grind-it-out victory over a borderline dreadful Seattle team. And without Ginn, that's all the 49ers might have accomplished Sunday. After his two returns, though, you could almost see the confidence needle move on the 49ers sidelines and afterward, in the home locker room. "Man, that lifted our team," said 49ers defensive tackle Ray McDonald. "Speed kills," said 49ers coach Jim Harbaugh of Ginn. "And he was moving." And how did Ginn himself feel? He was surprised as anyone about getting a kickoff and punt return in the same game -- the first player in 49ers franchise history to accomplish such a feat. "You do it on video games a lot," Ginn said. "But this ... it's a blessing." For everyone in a 49ers uniform, especially. Ginn's first touchdown was the most critical -- because it happened immediately after Seattle had closed to within 19-17 on the scoreboard with 3:56 remaining. Eleven seconds later, the score was 26-17. Ginn received the ball two yards deep in the end zone, sprinted out to the 15-yard line, made a hard cut right to find open space and sprinted to the goal line. "It was like he was running a 200-meter race and hitting the curve," said 49ers wide receiver Michael Crabtree. "I just saw him striding, and as soon as he hit the corner I said, 'Ted's gone.' "
"The play wasn't set up that way," marveled 49ers tight end Delanie Walker, who was on the kick return team. "We were set up to go left -- and he took it right." Less than two minutes later, Seattle goofed up and kicked again to Ginn, this time on a punt. He found a seam up the middle and ran untouched for six more points. If the Seahawks appeared slightly fooled, that's because they were. Coach Pete Carroll made a remarkable admission afterward. "Honestly, we didn't think Teddy Ginn was going to play," Carroll said. "He didn't do much in the preseason." This was correct. 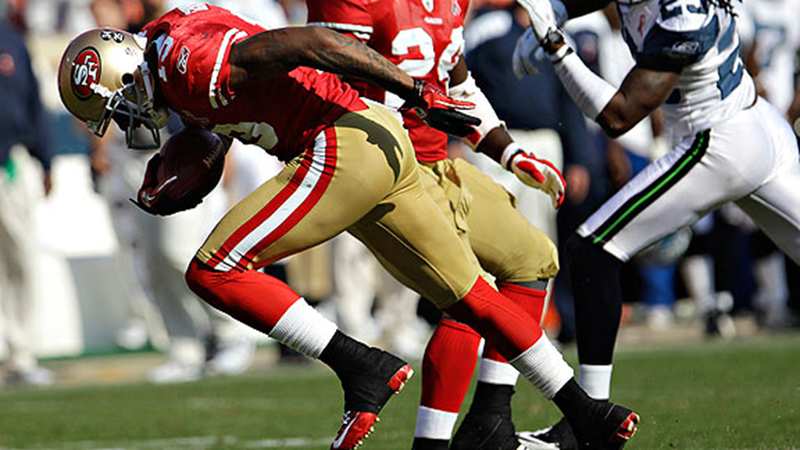 During the 49ers four preseason games, Ginn returned a total of one punt and one kickoff. The others were handled mostly by rookie Kendall Hunter. As recently as last Friday, Harbaugh had said Hunter was a likely candidate to be the kick returner. But that was a smoke screen. Ginn said he knew all along that he'd be handling both duties. "It was always in the plan," Ginn said. In one sense, yes. In another sense, no. Ginn came to the 49ers in a 2010 trade with Miami and brought a large-money contract with him. This season, he was scheduled to earn $2.2 million. But last week, Ginn agreed to take a pay cut down to $1 million. The easy conclusion: Ginn was told if he didn't accept a lower salary, he'd be gone. Ginn decided to stay. "I'm a team player," Ginn said. "It's not always about money. You come in, you play the game. And as you play the game, good things should happen for you." The experience may have humbled him a bit. On his kickoff return after he broke free, he held up the football with one hand 20 yards before he hit the goal line -- only to quickly draw it back to his body. "I looked up at the Jumbotron and saw that there was a guy behind me," Ginn explained. So maybe he's just a practical guy. Ginn left the locker room Sunday carrying the game ball presented to him by his teammates, but also wearing a modest striped shirt and a pair of old-school black Converse All-Stars. He's got four more pairs of All-Stars at home, in various colors. And get this: Ginn was a track and field athlete in high school but only ran the 110-meter hurdles and 200-meter races. Why not the 100 meters? "I wasn't fast enough for that one," Ginn said. "I was running it in 10.5 seconds, and there were guys doing 10.3." Not in a football uniform, they weren't. Ginn's performance Sunday will affect the way every opponent approaches the 49ers to this point. 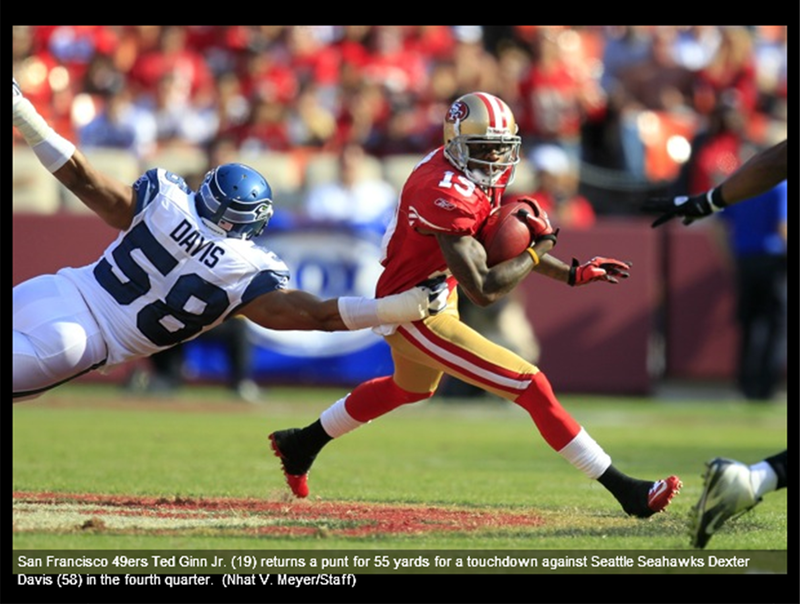 And how much more promising is the 49ers' season now as opposed to a week ago? SAN FRANCISCO -- Ted Ginn Jr. carried the game ball to keep for himself, and packed away two more footballs from his game-saving kick returns to present his twins. Jim Harbaugh didn't need a single souvenir. Hugs all around would do, from his parents, from his players. He left Candlestick Park on Sunday with that coveted victory over Pete Carroll and the defending NFC West champions in his NFL debut. Here's the deal, coach Carroll: Harbaugh is one up at this level. Ginn returned a kickoff and a punt for touchdowns in a minute's span late in the fourth quarter, and the San Francisco 49ers gave Harbaugh a 33-17 win over Seattle in his much-hyped debut and renewed coaching rivalry with Carroll. "I slept like a baby last night," said Harbaugh, a father of two young daughters. "I woke up every hour crying, making sure these guys were prepared in every way. And they had our back. Our players did a heck of a job." Especially Ginn, who delivered right when the Seahawks thought the momentum was theirs. He ran a kickoff back 102 yards moments after the defending NFC West champion Seahawks had closed within 19-17. It was the second-longest kick return at home and fourth-longest in team history. He then scored on a 55-yard punt return. "I got an opportunity to go out and show what I had," Ginn said. "It's great. You do it on the video game a lot, but you don't see it a lot in real life." Alex Smith exhibited the poise and polish Harbaugh believed the 2005 No. 1 overall pick still had in him despite recent history, going 15 for 20 for 124 yards and running for a 1-yard TD. David Akers kicked four field goals in his first game with San Francisco. New Seattle quarterback Tarvaris Jackson threw a late 55-yard touchdown pass to Harbaugh's former Stanford star, Doug Baldwin, in his Seahawks debut as Matt Hasselbeck's replacement. Harbaugh pulled Smith into a seconds-long bearhug after he hustled to the sideline after his short TD run just before halftime in which he spun into the end zone to put the 49ers up 16-0. Ginn saved the game with a huge day on special teams. This is the guy who returned kickoffs of 100 and 101 yards for touchdowns in a 30-25 win for Miami over the New York Jets on Nov. 1, 2009. This time, Ginn's kids -- Kyrsten and Theodore III -- get to help celebrate. With the coach's parents, Jack and Jackie Harbaugh, in the stands to cheer him in the opener, the former NFL QB was as animated as ever -- waving his arms, pacing the sideline and congratulating his players at every chance. He embraced Smith for several seconds. He gave Ginn hugs after both TDs. "It felt really like we were right there to take this game over, and then things just fell apart in the kicking game," Carroll said. "Ted Ginn did his stuff and had two great plays and took our chance of coming back in this game away." Dozens of American flags whipped in the wind off San Francisco Bay in the parking lots of sold-out Candlestick Park before the game on the 10th anniversary of Sept. 11. Flags inside flew at half-staff and many of the 69,732 fans sported red, white and blue. And San Francisco police considered it a well-behaved crowd at Candlestick, where fan violence and a shooting marred the Raiders-49ers exhibition matchup last month. Rivals dating to their days in the Pac-10, Carroll couldn't complain about Harbaugh running up the score in this one. Seattle's offense had enough problems for Carroll to worry about what was happening on the other sideline. The two quickly shook hands afterward and called it good. It was Carroll who in 2009 met Harbaugh at midfield postgame with a "What's your deal?" after Stanford ran up the score in a 55-21 rout at Southern California and even attempted a late 2-point conversion with the game out of reach. In Harbaugh's first season in 2007, the Cardinal traveled to Los Angeles as 41-point underdogs only to stun the second-ranked Trojans 24-23 and end their 35-game home winning streak. Akers kicked field goals of 27, 24, 31 and 18 yards in an impressive first game with the 49ers in place of the retired Joe Nedney. Jackson, Brett Favre's backup in Minnesota the past two seasons, completed his first six passes but was sacked twice in as many drives to start the game -- by Ray McDonald and Justin Smith -- and five times total. He was 21 of 37 for 197 yards and two TDs with one interception. First downs were scarce and San Francisco's defense was stingy behind defensive tackles McDonald and Smith. The 49ers were 0 for 9 on third-down conversions before Smith's 12-yard completion to Braylon Edwards early in the fourth. Edwards wound up with three catches for 27 yards in his 49ers debut. He was given a fresh start by another Michigan man, Harbaugh. Back on a one-year free-agent deal when most everybody figured he'd turn up elsewhere, Smith generated cheers instead of boos from the home crowd. He made quick decisions and scurried out of trouble several times with defenders coming right at him. "It's fun to come over and see your coach just as jacked as you," Smith said. "We were all pumped up." The Seahawks, 7-9 last year before stunning the reigning Super Bowl champion Saints in the playoffs for the first victory by a team with a losing record, have their work cut out for them to defend in a division that became known as the NFC Worst in 2010. One telling moment Sunday: Jackson was sacked by Parys Haralson, who forced a fumble that was recovered in the air by Will Tukuafu on his first career play from scrimmage. That set up Akers' second field goal. What a difference from last year's opener between the division foes. The 49ers lost at Seattle 31-6 last September on the way to a 0-5 start that dashed San Francisco's hopes of winning the division. The 49ers returned the favor with a 40-21 home win in December, but it wasn't enough to save then-coach Mike Singletary's job. Harbaugh was hired from Stanford on a $25 million, five-year deal to turn around a franchise that has gone since 2002 without a playoff berth or winning record. Frank Gore, with a new $21 million, three-year deal after he missed the final five games last season with a fractured right hip, ran for 59 yards on 22 carries and made three catches for 19 yards. Vernon Davis had a team-high five receptions. Punter of the Day- Andy Lee, 49ers Winds were blowing 15 miles-per-hour at Candlestick Park on Sunday and Andy Lee had a nice day working with them. Lee punted five times, averaging 59.6 yards-per-punt in a 33-17 win over the Seahawks. Lee set a club record for average yards-per-punt (minimum 4 punts), breaking his own mark of 57.2, set against the Steelers on September 23, 2007. This was the 3rd-best single-game punting performance in NFL HISTORY Lee's punts were 61, 64, 58, 55, and 60 yards. His 64-yard punt pinned the Seahawks on their own 2-yard line. Twice he punted from inside the 15-yard line and his punts in those instances were 61 yards (unreturned) and 58 yards (returned for 14 yards). Lee averaged 54.2 net yards per punt. The only punter in the last 35 seasons with a better net punting average was Rohn Stark, who averaged 59.5 net yards per punt against the Oilers on September 13, 1992. From Elias: Ted Ginn Jr. is the 1st player in NFL history to return two kicks for TD (punts or kickoffs) in the final 5 minutes of a game. 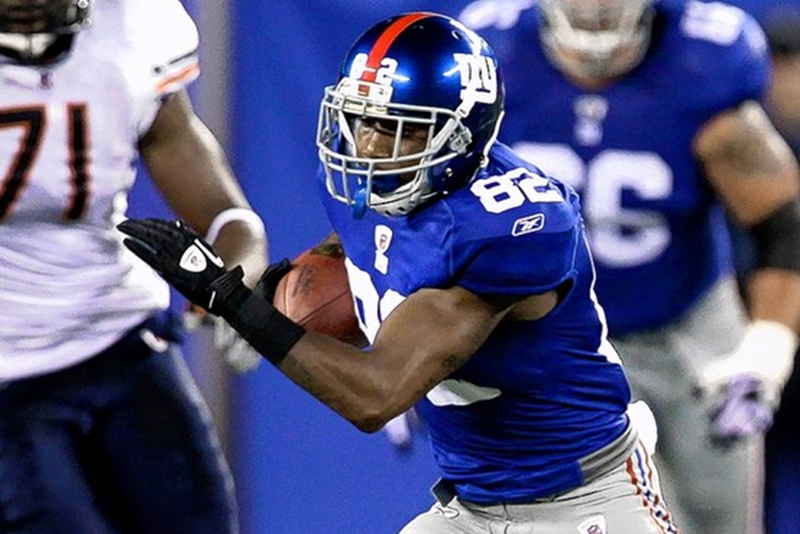 You'd think the Giants receiving corps would be in tatters after losing out on one former Pro Bowl wideout, Plaxico Burress, and then seeing another, Steve Smith, depart via free agency. 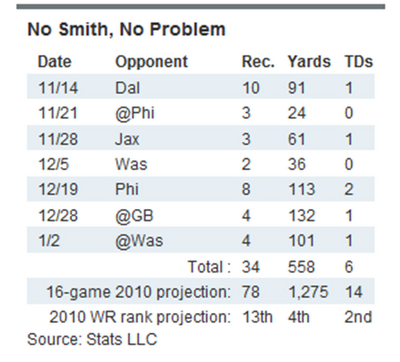 But if the performance of Mario Manningham in Steve Smith's absence last year is any indication, the Giants actually may be better off. 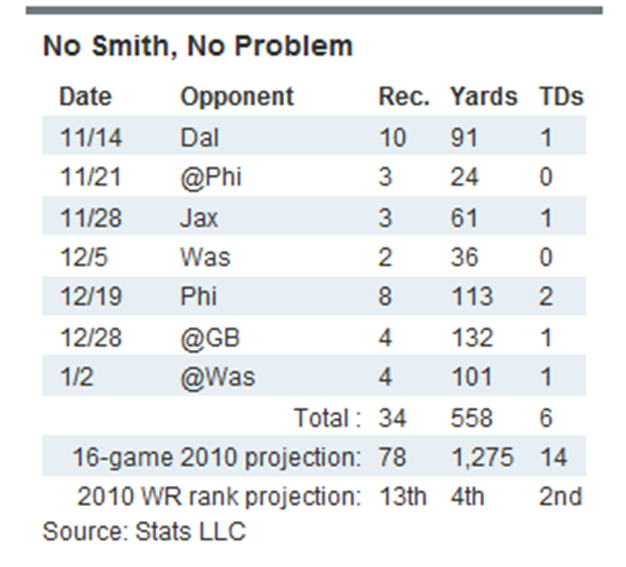 In the seven games that Smith missed with his knee injury, Manningham posted 34 catches for 558 yards and six scores. Over a 16 game season, that projects to 78 catches, 1,275 yards and 14 touchdowns—numbers that last year would have ranked 13th, 4th and 2nd, respectively, among all NFL wide receivers. But you don't need projections to classify Manningham as elite. In 2010, he ranked second in the NFL behind only Pittsburgh's Mike Wallace in the average gain for a wide receiver whenever the ball was thrown his way, whether or not it was complete. Manningham gained 944 yards on just 92 "targets," according to Stats LLC—an average of 10.3 yards. Last year, that same yards-per-target stat could have been used to project the emergence of Hakeem Nicks, who ranked fourth in the category in 2009. In just 13 games, Nicks ended up increasing his catches by 32, his yards by 262 and his touchdowns by five. Should Mannigham see a similar spike in productivity, the result could be the most dynamic receiving duo in franchise history. Big Blue has never had a pair of receivers to each record over 1,000 receiving yards in the same season. The closest was in 1999 when Amani Toomer had 1,183 yards and Ike Hilliard added 996. But that pair combined for only nine scores, a total Manningham matched himself in 2010 and seems set to improve on now that he's a full-time starter. The St. Louis Rams' rookie tight end Lance Kendricks has become Sam Bradford's favorite target. 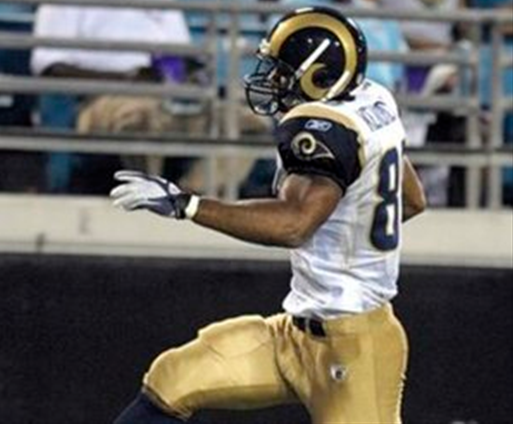 Sep 2, 2011 - Lance Kendricks continued to serve as Sam Bradford's favorite target in the St. Louis Rams' new offense Thursday, catching three balls for 73 yards and his third touchdown of the preseason to consolidate his position as the Rams' top receiving option. The Rams rookie, who was seen by some as an overdraft when he went in the second round of the 2011 NFL Draft, has looked like a perfect fit for Josh McDaniels's offense so far. He's got 11 receptions for 155 yards and three touchdowns in four games; only Brandon Gibson, whose 83-yard touchdown reception sort of skews things, and Donnie Avery have accrued 100 receiving yards. Kendricks's performance comes as McDaniels seems ready to emphasize the role of the tight end in the Rams' offense, and with Michael Hoomanawanui fragile at best and Fendi Onobun not ready to start by any stretch of the imagination a strong start will be crucial for McDaniels's plan to work. Rookie defensive tackle Karl Klug not only got the sack – he actually had two on the night – but he also recorded the first safety of his life in Thursday’s preseason win over the Saints. Klug tackled Saints quarterback Sean Canfield in the end zone to give the Titans a 2-0 lead in the first quarter. So did he think about breaking out a safety dance? Klug has had plenty to celebrate this preseason. The fifth-round pick from Iowa exceeded everyone’s expectations. He led the Titans with two sacks in the four preseason games.